Less than an hour ago, you were rocketed up from the Kennedy spaceport, to embark on a journey that will take you out into the far reaches of the universe. Your first stop is the slowly turning wheel of Space Station One, in orbit high above the Equator. The winged ship that has carried you up from the Earth nudges gently into the docking section, and you disembark into the 600-foot-diameter space city, to await the shuttle service for the Moon. While you wait in the spacious observation lounge, you enjoy a breathtaking view of Earth. Twice every minute the dazzling spectacle swings past you, for the space station is revolving like a cosmic carousel. As it turns, centrifugal force gives you a feeling of normal weight; you can walk along the curving floor, pour a drink and know that it will stay in the glass, distinguish between 'Up' and 'Down'. So opens an adventure in space and time which began three million years ago before the human race existed-and ends with Man confronting his destiny among the stars. It is a journey that will sweep you across the stark beauty of the lunar plains, awaiting the slow dawn as the Earth wanes in the sky. From the Moon it will take you half a billion miles to the greatest of all the planets, mighty Jupiter. Surely there can be no life here in the freezing cold so far from the Sun! But you are following a trail that has led you clear across the Solar System; you believe that there is something here, though what it is you cannot guess. It may be good or evil, or utterly indifferent-but you have to know. And for three million years, it has been waiting for you to come. With those words, MGM announced to the world the release of Stanley Kubrick's masterpiece 2001 : A Space Odyssey. That was in 1968. Kubrick's and Clarke's future was still 33 years away. For those of us in 1968 who had witnessed the fledging space program through the Mercury and Gemini space flights, and into the initial flights of Apollo, 2001's vision of a journey to the moon and beyond seemed not like science fiction, but a prediction of what future space flight would actually be like. The images Stanley Kubrick and Arthur Clarke presented us, were a prediction of the future unlike anything ever seen before or since, and not only influenced a generation, but changed the world forever. 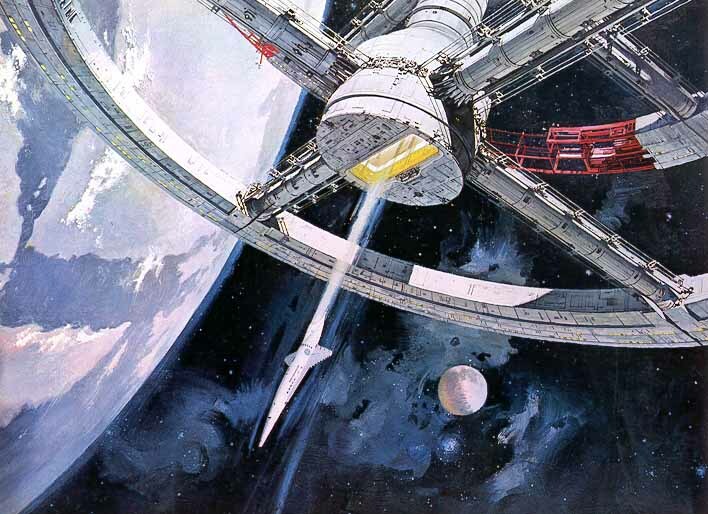 But what would the future hold, and would it live up to Kubrick's and Clarke's predictions? Well, it is now the year 2004. The year 2001, which myself, as well as others, waited 33 years to arrive, has come and gone. Passed forever, that legendary year of the new millennia. What happened? Did the year 2001 live up to Kubrick's and Clarke's predictions? Or did the vision of 2001 exceeded the reality of 2001? While we have achieved some of the things depicted in the film, the majority we have not. Did 2001 fail in its prediction, or did we fail? These are questions which have been debated time and again, and will probably continue to be debated. I do know that 2001 had a significant impact on my life, and that is what has led to the development of this web site. In 1968 I wanted to be a part of 2001's prediction of the future. This led me to study physics in school and pursue employment in the aerospace industry. But one of the biggest influences 2001 had on my life was in the area of spacesuits. The 2001 suits were so masterfully and beautifully created, that they not only looked futuristic, but also looked very realistic. The suits, as well as all of the other sets looked like they would actually function. I fell in love with the 2001 suits...I wanted one. So began my quest for a spacesuit from 2001. I searched for 16 years without finding anything. However in searching for a 2001 spacesuit, I found that real high altitude pressure suits and spacesuits could be found. So I started acquiring them, and as a result now have the largest privately owned collection of pressure suits and spacesuits in the US. These suits are now used as reference material to support consulting work for films and museums (www.pressuresuit.com). After looking for 16 years for a 2001 spacesuit, I came across the red 2001 helmet quite by accident. I would have been happy with one of the white helmets, but as fortune would have it, I found Dave Bowman's red helmet. Along with the helmet I acquired Bowman's flight coveralls and the boots from Poole's yellow spacesuit. The work that went into restoring the original helmet is described in this site, as well as the effort to reconstruct the rest of a 2001 spacesuit. Now, for those who argue that the film failed in predicting the future, I would argue that we, as a society failed. We gave up on the Moon in the mid 70's and curtailed the momentum which was to have had us on Mars by 1984. By 1984? Yes those were the plans.....now we can't even go back to the Moon. our Odyssey has just begun.